Microsoft last week stopped offering Windows 10’s November upgrade as a disk image, shutting down the route many had used to skip the wait as the company slowly rolls out the refresh via Windows Update. The .iso files are still available, but when downloaded using Microsoft’s Media Creation Tool, they now install the original July 29 edition of Windows 10, not the November upgrade as they did earlier. 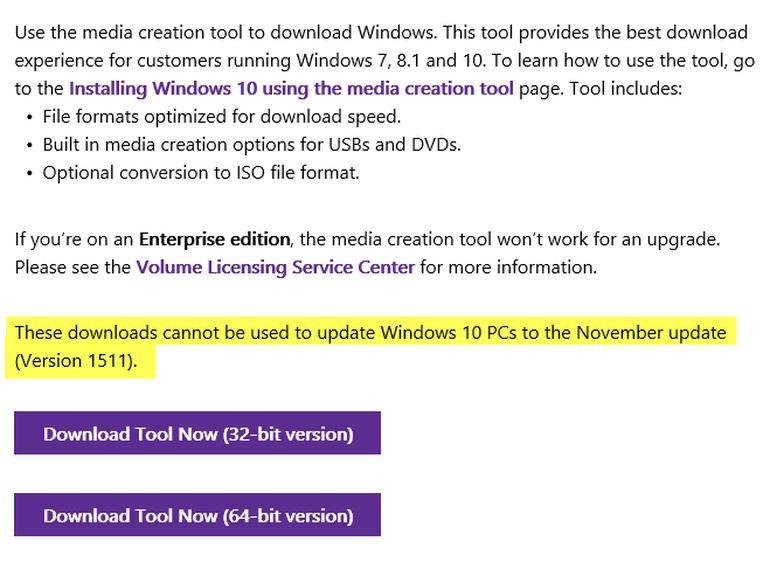 “These downloads cannot be used to update Windows 10 PCs to the November update (Version 1511),” Microsoft confirmed in the revised page dedicated to downloading Windows 10 when viewed from a Windows PC.